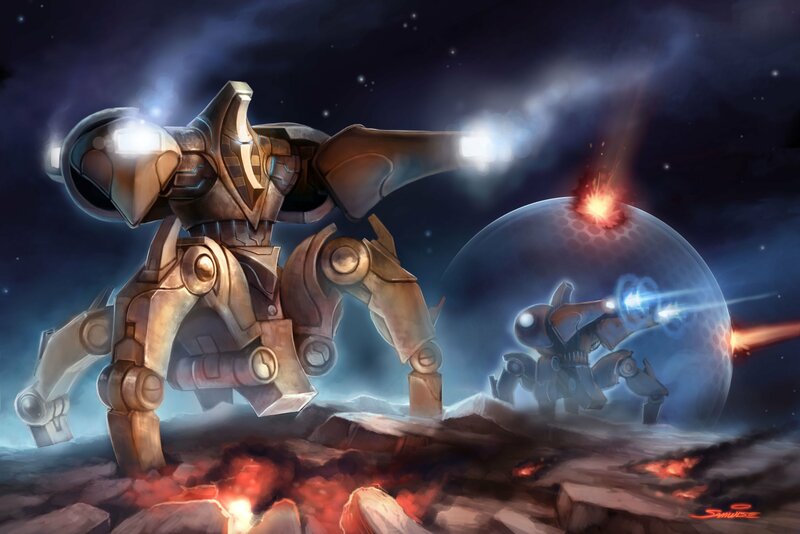 The larger cybershell used by Immortals can mount two light energy cannons (Phase Disruptors or Photon Cannons), but lacks the Warp system of the standard model. "Hardened Shields" dissipate incoming energy, even if Plasma Shield DR is penetrated, reducing all damage. Attributes: ST 150 ; DX 14 ; IQ 12 ; HT 14 . Secondary Characteristics: Damage 16d/18d; BL 4500 lbs. ; HP 150 ; Will 16 ; Per 12 ; FP - ; Speed 7.00 ; Move 12 . Advantages: SM +4; Protoss Cybershell ; DR 200 (Can't Wear Armor, -40%) ; Enhanced Move 1 (Ground) ; Extra Attack 1 (Linked Fire-Control: Dual Cannons, -20%) ; Injury Tolerance (Damage Reduction 2; Psionic, -10%) ; Plasma Shields 200 ; Regeneration (Extreme; Plasma Shields only) ; an additional Weapon Mount (total 2) . Standard Loadout: Dual Light (Phase Disruptor or Photon) Cannons.